Mark Calisi says he believes he lost his Chrysler-Jeep dealership on Long Island because he irritated a company executive. Yale King was told that his Jeep and Buick-Pontiac-GMC stores near Denver were no longer wanted, even though he regularly doubled the carmakers sales goals. James Painter and his 10 children cannot understand why Chrysler eliminated the two Utah dealerships they ran successfully for decades, particularly since the company allowed their immediate neighbor to open a new Chrysler dealership this month. They are among the hundreds of dealers from all corners of the United States fighting to get back their businesses  and in many cases their good names, tarnished by implications of poor performance  through an arbitration process that will begin next week. Chrysler and General Motors cut loose more than 2,000 dealers last year as part of their bankruptcy reorganization, but Congress is now forcing them to justify the closures after hearing so many stories of devastated families and communities. Theyve taken everything we own, said Patrick Painter, one of James Painters sons. All three of the familys dealerships  the Chrysler store that three generations ran for 65 years, the Chevrolet-Buick store nearby and the Chrysler store that James Painter opened 200 miles away at Chryslers request, spending two years away from his family to do so  were terminated over the course of two days last May, despite being profitable and debt-free. As of Friday afternoon, 915 dealers had filed to contest their termination, according to an executive with the American Arbitration Association, which is overseeing the review process. More than 400 were filed since Thursday and more were expected before the deadline of midnight Monday. 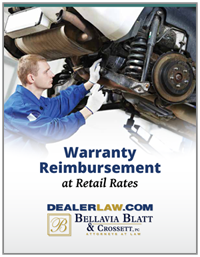 Leonard Bellavia, a lawyer in Mineola, N.Y., who represents about 40 dealers who have filed for arbitration, said each dealer could expect to spend at least $30,000 challenging the companies decisions unless a settlement was reached before arbitration. The process must finish by mid-June. Those who lose will be out even more money and will have no further chance to appeal; winners can rejoin a company that didnt want them any longer. G.M. terminated about 1,300 dealers, most of which are still open because they were given until next October to wind down operations. An additional 700 dealers lost the rights to sell one or more brands but remain with G.M. Many have been encouraged by Mr. Whitacres recent comments suggesting that the company might have been too aggressive in cutting dealerships and probably made some mistakes in its selections. Chrysler, though, has taken a much harder line, insisting that large numbers of reinstatements could throw its recovery off track and hurt current dealers. Chrysler eliminated 789 dealers, about a quarter of its network, and forced them to close last June on about four weeks notice. Because the cuts were made in bankruptcy, Chrysler avoided having to compensate those dealers for the franchises they lost, whereas G.M. agreed to pay an average of more than $400,000 to each dealer. Chryslers chief executive, Sergio Marchionne, who was not involved in the company when the cuts were made, nonetheless defended them this month during a speech to an industry conference. But former dealers hope to show arbitrators that the decisions were anything but fair. Letters that Congress required the carmakers to send dealers this month explaining the criteria used to select them have fueled claims that Chrysler was more subjective, because it provided less specific information than G.M. offered. Mr. Calisi, who owns Eagle Auto Mall on the east end of Long Island, said he met all of Chryslers performance criteria and spent millions of dollars upgrading his building but was eliminated in favor of a Dodge dealer in a much older, more out-of-the-way space nearby. In bankruptcy court, Chrysler said Mr. Calisi was chosen because Chrysler-Jeep shared his showroom with Kia, Mazda and Volvo. But he obtained internal e-mail messages among Chrysler executives, in which he was described as too litigious after a dispute with the company over incentives for advertising. Mr. Calisi said the loss of Chrysler-Jeep left him unable to make his annual contribution of $500,000 to a local charity that helps mentally retarded children and adults. A Chrysler spokeswoman, Kathy Graham, dismissed claims that dealers were singled out for retribution. This wasnt easy for anybody, but it wasnt personal, she said. Though Chryslers sales plummeted in the second half of 2009, Ms. Graham said remaining dealers reported higher sales and profitability, which helps the company in the long term. The terminated dealers say they could help G.M. and Chrysler even more by staying open. Mr. King said his Jeep store in Longmont, Colo., was on pace to outsell the nearby Chrysler-Dodge outlet for the year, and his G.M. store still is one of the regions top sellers. For some dealers, however, the offer of arbitration comes too late to do much good. For the Painters, who still sell used cars at their Utah dealerships, reinstatement could pose a new challenge. The Nissan dealership adjacent to their store in St. George, on the Arizona border, began selling Chrysler vehicles last week. Family members, several of whom have had their wedding receptions in the showrooms, are confused as to why Chrysler would do that when it did not want dealers selling rival brands under the same roof.